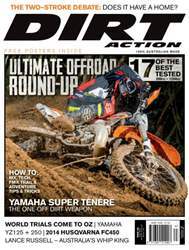 Issue 182 of DIRT ACTION has one of the most ambitious off-road test features ever compiled. We test the best bikes in the categories from 200cc two-stroke right up to a 1200 adventure machine. It’s a round-up of the best bikes in the bush and you find a more comprehensive test anywhere else. 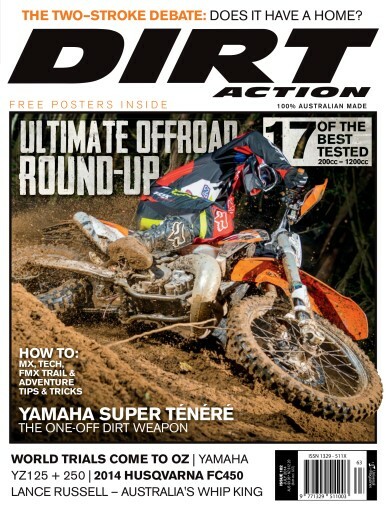 We also cover the Australian World Trials round that saw the greatest riders compete on our shores again. We test Yamaha’s YZ125 and 250 two-strokes and take a run on the 2014 Husqvarna FC450. And then we start a fight – should the two-stroke have a home in motocross anymore? You can ride a 250 two-stroke against the 250F in Australia but is this completely unfair? We talk to the guys on the ground and the decision makers to get some sense in this hot topic.